Box Dimensions (LxWxH) 1.5 x 1.0 x 0.25"
DBA-BL Blank Plate (Black) is rated 5.0 out of 5 by 4. Rated 5 out of 5 by Mr. Bungle from Mind Blown! This blank plate will change your life. Seriously people, no more awkward D size holes. This plate covers it up like bar is on soap. Stir in some M3 screws with this baby and you're cooking with fire! A+ Would buy again. 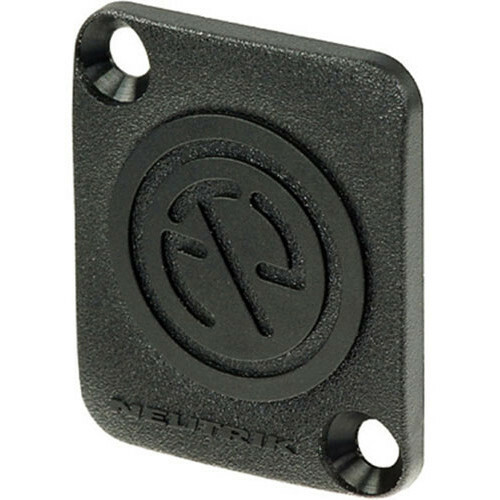 Rated 5 out of 5 by Patrick from Perfect for Neutrik Panel I use this cover on the unused slot on the Neutrik 30 Degree Angled Rack Panel (19) BH# NENZP1RU8. The cover is a perfect match for the port. Rated 5 out of 5 by None from These Came In Handy I used them in my upgrading of the stations production truck. Came in handy.